The location of the Persian cat breeder can play a part in the price of a Persian. On the U.S. east coast, the price of Persian cats seems to be higher than those in the mid-west or west coast. I believe this price difference is based on the overall cost of living in the east and on the west coast. The time of year that kittens are for sale can play a role in the price of the Persian kittens. Most cats come into season when there is more daylight and longer days. Therefore, during the winter months, cats do not come into heat as often or at all. This means that there are very few Persian kittens available in the early part of the year. The scarcity of kittens during this time of year can drive the price of Persian kittens up (just a bit). Additionally, many Persian cat breeders plan the breeding of their cats around their show schedules. Persian cat prices can vary because of whether or not the kittens are registered. Responsible cat breeders sell registered kittens and cats. Some breeders may withhold registration papers of their kittens until they receive written verification that the kitten has been altered. Unless your kitten is registered, you have no proof that the Persian kitten you are looking at is actually purebred or the offspring of purebred Persian cats. At Pelaqita Persians, a kitten is always sold with registration papers (never withheld) because our kittens are already spayed or neutered prior to going to their new home (included in the price of the kitten). Responsible Persian cat breeders provide their kitten buyers with a written contract and health guarantee. Health guarantees differ from breeder to breeder so it is important to ask about a health guarantee and read it thoroughly before purchasing the kitten (compare them to each other if you are looking at different breeders and trying to decide which breeder to get a kitten from). If the Persian cat breeder says that they have cats that are DNA tested negative for PKD1 - ask to see those certificates. A good breeder should not be offended by that request. Pelaqita Persians offers a five-year health/genetic guarantee and a six-year HCM guarantee. They take the time to interview prospective buyers, to explain their breeding program, to develop a contract that is legally enforceable by either party in a court of law should something go wrong. A good Persian cat breeder provides information to prospective buyers on Persian cats, their grooming, care, feeding requirements, and much more. A good breeder will properly vaccinate their kittens with age appropriate vaccinations. A good Persian cat breeder will send the kitten home with its new owner along with (at a minimum) a packet that contains a sample of what the kitten has been eating, registration slip, information on caring for the kitten, a health record of its vaccinations and wormings. Many breeders provide a buyer with coupons for the food or other items, a list of suggested supplies and toys, and photos of the parents. Pelaqita Persians food starter pack contains: 6.6 pound bag of dry kibble, a case of canned food, treats, etc. A responsible Persian cat breeder spends a great deal of time and money ensuring that their cats and kittens are healthy. 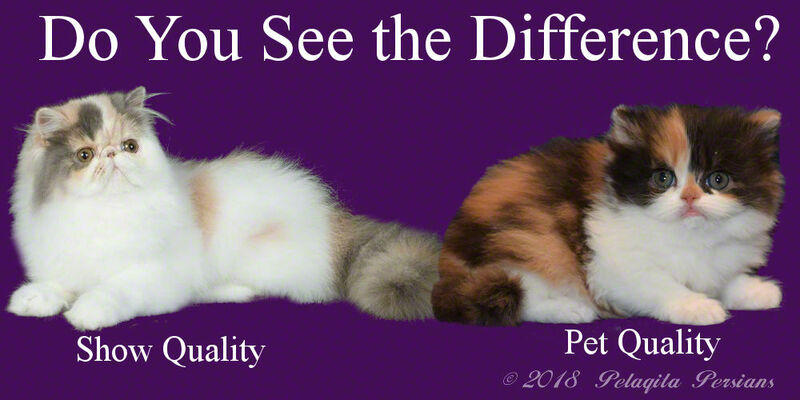 They test for known genetic problems in the Persian cat breed (i.e., PKD1). They have their cats routinely examined by their veterinarian. Their cats and kittens have age appropriate vaccinations and wormings. At Pelaqita Persians, we believe that kittens destined for a non-breeding or show home should be altered prior to that kitten going to the pet home. The spay and neuter of the kitten is included in the price of our kittens. Persian cats come in a variety of colors: solid color, bi-color, tabbies, color points, particolor, smokes, shaded, and the list goes on. Some colors are more popular with breeders, show people, judges and buyers. This popularity (or lack of) can influence the price of Persian cats. Responsible Persian cat breeders always breed to the breed standard of their preferred registry (i.e., CFA, TICA, etc.). They breed because of their love for the Persian breed, because they love their cats, because they love kittens and because they just enjoy their cats. They want to improve the breed by breeding cats that will improve on what they are whether it be looks or genetic health. Not every Persian kitten will meet the exacting criteria of their breed standard. These faults are usually minor in nature (i.e., ears set too high, eyes not round enough, a bad bite, coat not being long or plush enough, a nose not being where it needs to be). Just because a Persian kitten has a fault according to the breed standard does not make it less desirable. The price of a Persian may reflect how close to the breed standard the kitten is. Look at the picture of the two kittens at the top of this page. Can you see the difference between the two kittens? You conforms to the CFA Persian Breed Standard and one does not. We have all heard the old adage "you get what you pay for." This is never more valid than when looking for a purebred Persian cat or kitten. Be prepared to pay between $950 - $2000 for a pet quality Persian cat (spay or neuter contract). Look for an experienced, dedicated Persian cat breeder who obviously cares a great deal about their cats, their breeding program, their reputation, the health and well-being of their cats - NOT just the money the kitten may bring. Also, look for a breeder that is showing their cats or used to show their cats. Why? Becuase they are breeding to the Persian Breed Standard. Information on recognizing and finding good Persian cat breeders.